It’s Not Mere a Sticker, it’s Your Brand Who Knows Better than Us? 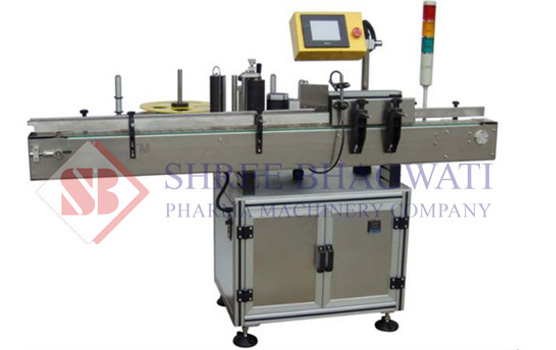 The vial sticker labeling machine multi-pack-120 is a fully automatic equipment; with many user friendly features. This advanced vial labelling machine integrates the most up to date, micro processor controlled, label dispensing system. Moreover it also includes the latest sensing system for labels and other identical products. In fact it is regarded as the perfect machine for labeling tiny and round shaped products such as vials, bottles, and several other similar items. Besides, this robust equipment can quickly label up to 150 units in one minute, depending on the diameter of the product; as well as the size of the label. The vial sticker labeling machine is widely utilized for labeling vials and bottles of small sizes; that are made from materials like glass, plastic, PET, HDPE, PP, etc. This highly versatile and elegantly designed multi pack model – 120 of vial labeling machine even has a special and distinct, single point synchronized speed control system. Further, one of the inherent and preset characteristics of this machine is the label length detection system. This unique feature thereby helps you to avoid the necessity of manually feeding, and storing the information related to the length of the labels within the memory of the machine; and retrieving the same data every time you need to change the size of the label and restart the equipment. Consequently this cost effective and time saving system, saves a considerable amount of time, prevents down time of the machine, and also enables you to enhance the productivity. Another outstanding element of this model is the automatic product alignment system, which is synchronized with the top holding belt system. Actually, this vial sticker labeling machine includes lots of features to fulfill the primary requirements of a standard model. Hence it is commonly used by several industrial segments in various national and international regions.